Its’ a Feast of Roast! I don’t know about you but I used to look forward to special occasions like wedding or festive seasons to enjoy the much renowned Chinese roast dishes. Of course we are more spoilt now simply because we can savor these more often but they do come with a hefty price tag. 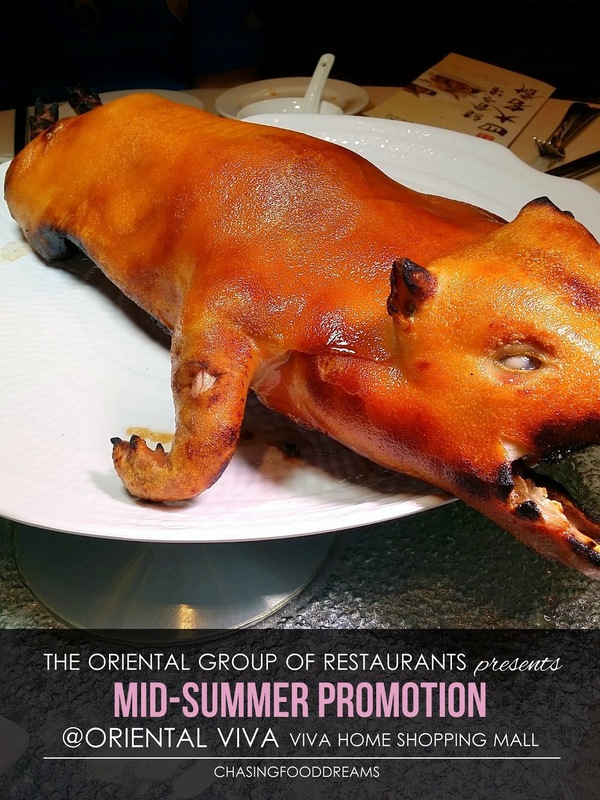 For lovers of the famous Suckling Pig and Peking Duck, The Oriental Group of Restaurants is having a monthly Mid-Summer Promotion in August at various outlets in various locations featuring a feast of Chinese Roasts and BBQ Meats. The Oriental Group of Restaurants started their first restaurant in 2000. Today, it has grown to 9 prestigious restaurants - Noble House & Noble Banquet, The Ming Room in Bangsar Shopping Centre,Maju Palace at the Maju Junction Mall, Oriental Pavilion at Jaya 33, Oriental Banquet in Section 19, PJ, The Han Room in the Gardens Mall, Mid Valley City, Oriental Viva in Viva Home Shopping Mall, and Noble Mansion, at Plaza 33, PJ. Each one specialized in fine Cantonese cuisine and they are various signatures in each location under the supervision of Chef Justin Hor, Group Executive Chef/Director. 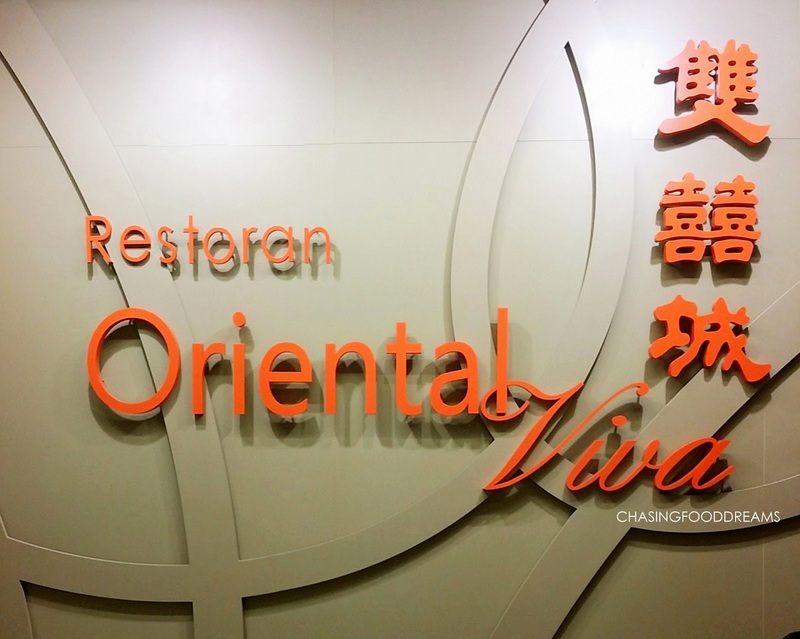 We checked in to Oriental Viva at Viva Mall a few days ago to check out what the promotion is all about. Looks like the word is out, the restaurant is swarmed with tables filled with loads of delicious Chinese cuisine. I could see wait staff scurrying around with platters of aromatic roast and BBQ meats as well. From now till August 28, 2014, Oriental Viva Restaurant is having a Mid-Summer Promotion on Roast and BBQ meats. Though some of the roast and BBQ meats are constantly available, this month showcase special roasts and BBQ meat at a promotional price. Preparing roast and BBQ meat requires lots of experience and skill. It’s a Cantonese specialty and The Oriental Group of Restaurants certainly lives up to their sumptuous roast and BBQ signatures. Drooling carnivore’s post coming right up! 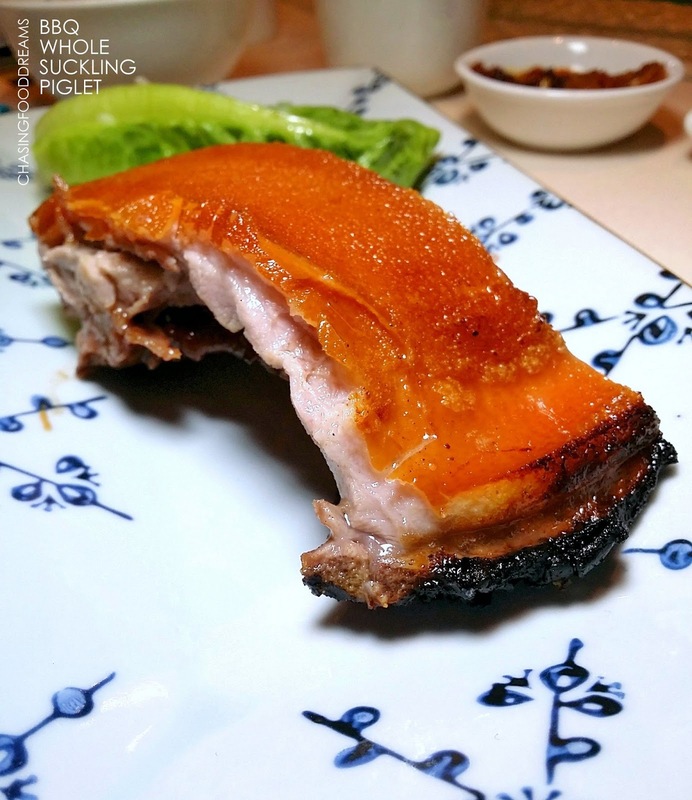 The evening took off with the famous Peking Duck with Two Courses (RM68). Golden lacquered Peking Duck looked like a diva that night. Glistening amber skin stretched evenly all over, marking a crispy skin of expectation. The whole duck is swiftly skinned in front of us as we watched in awe at the amazement of this dish. Then it’s quickly stuffed into thin crepes with hoisin sauce and served with curled scallion and crisp cucumber. The whole duck is now taken back to the kitchen for the second preparation. The meat is removed and diced. It is then sautéed with other vegetables and nuts in a savory sweet soy sauce based flavor. Piled on top of crispy deep fried vermicelli noodles, the sautéed minced duck meat is to be savored with beautifully trimmed crisp lettuce and crispy noodles. Yum… the pairing of crispy lettuce balanced the beautiful rich duck meat well and the crispy noodles gave this more bite. We even savored the minced duck meat on its own because it was so yummy. Both courses are such a steal at the promotional price! Next up, we had the opulent BBQ Whole Suckling Piglet Meat with Special Sauce served with Chilled Citrus Juice (RM188). I can feel a lot of eyes homing in on the golden piglet with envy. I would be too if some other table were having this! The piglet is quite a good size. It was deftly cut into pieces with a scissors right in front of us, making us drool at the sight of the golden hog and the sound of crispy skin. My piece of the Suckling Pig is beyond my expectation. How do you express something so scrumptious and amazing that makes you want the experience to go on forever? Ultra crispy cracking that breaks into shards upon a cut and tender juicy meat that is superbly season and so moreish. There is just enough fat to make this divine. Since there we only six of us that night, we were very happy with extra helpings. The whole piglet is edible and we left nothing untouched. The piglet is served with a platter of chilled lettuce dressed in citrus vinaigrette and shots of chilled citrus juice served on ice. What a pairing… both are meant to lighten and cleanse the palette after the richness of the piglet. Oriental Viva’s BBQ Whole Suckling Piglet Meat with Special Sauce is truly a treat! Though we just had the piglet, we also had the Roasted Pork (RM10). The Roasted Pork Belly had all the right ticks for a delicious Roasted Pork. Crispy and crunchy skin with layers of savory fat and meat summed up the dish. 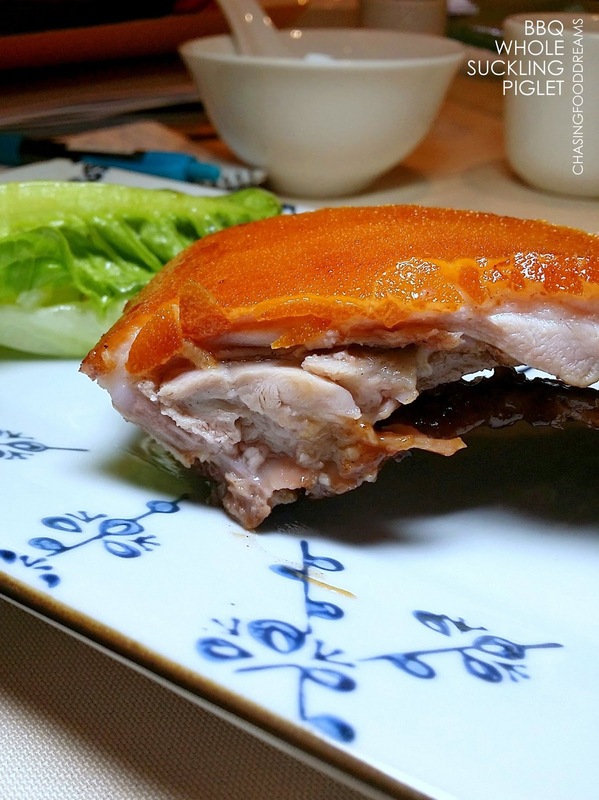 It’s moist and tender, a must for porcine lovers…. Roasted Pigeon (RM38 each) are definitely another treat! The little birds are much sought after delicacies in Asia. These are well marinated with comes with a dark rich amber hue skin. Its definitely flavorful but lacked the moistness to make this truly juicy. Still, I enjoyed this very much with the plum sauce and salt & pepper served on the side. Stir Fried Asparagus Beans with XO Sauce was the greens of the day. Even this dish is presented prettily. Aparagus eans shared texture familiarity with asparagus and beans. I like how the beans are kept crunchy. The XO sauce is aromatic and moreish with notes of spiciness. Braised Egg Noodles with Sea Cucumber in Clay Pot won all our hearts that night. A brilliant creation showcasing Mee Pok noodles braised in a savory sweet dark brown sauce with thick chunks of sea cucumber, caramelized shallots and garlic and assorted mushrooms. I love how the noodles took on the flavors. The sea cucumbers are braised to a gelatinous texture, a wobbly sensation of savory flavors. This dish is absolutely a stunner in flavors and evokes comfort in each slurp! We ended the evening with a modern presentation of Lemon Grass Jelly. Beautifully infused with lemongrass, the wobbly jelly is served with fine crushed ice, a refreshing ending to a carnivore’s meal! There are 63 dishes on promotion at Oriental Viva available from now till August 28th. Highly recommended on my list are BBQ Whole Suckling Piglet Meat with Special Sauce served with Chilled Citrus Juice, Peking Duck and Braised Egg Noodles with Sea Cucumber in Clay Pot. Do check out more promotions at other outlets at The Oriental Group of Restaurants website and Facebook. It’s a feast that you won’t want to miss! Oooo...duck! I'd choose that over the pig but of course, I would want both if I could. Slurpssss!!!!! Give me that suckling pig & peking Duck pleaseeeeeeeee!!!!! !